apnscp supports simple MySQL database snapshots as of August 28, 2016. Snapshots are ideal for preserving your database structure before a software update or any situation in which there is risk of loss of data not covered by the nightly backups. Snapshots perform a full database export and stores this file, uncompressed, in your backup directory. Snapshots are automatically removed after 5 days. Snapshots that have been taken may be used, along with automated backups, for rollbacks within the control panel. Database restore interface. Camera icon indicates a snapshot. Select the database to snapshot. Select Snapshot from the actions available in the dropdown. A snapshot will process, which may take a few minutes depending upon size. Once completed a modal dialog will pop-in confirming success. Snapshots may be accessed within the control panel for 5 days after which time they are automatically deleted. 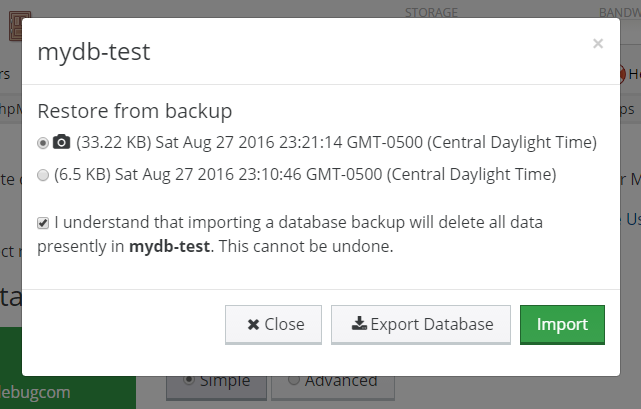 A better long-term solution is to use Databases > MySQL Backups within the control panel to configure automatic backups with rollout. Select the database to restore. Select Restore from Backup from the actions available in the dropdown. Choose which backup to restore from. Backups are sorted by most recent first. Snapshots are denoted by a camera icon. Check the box to confirm deletion of your current database. All data in the database will be emptied. All backup tasks and user privileges will be preserved. Once detected successfully, the backup will appear as an option to restore from. This entry was posted in MySQL and tagged backups, control panel, mysql.